Chokladbollar have always been a favorite Swedish treat. I think they’re a favorite because of their simplicity; they’re not a complicated pastry, they’re just good. I remember a few summers ago staying at my friend Orianna’s in Sweden. Life wasn’t at its best at that period in my life, and I had taken money I had been saving in order to go on a two week summer trip to Sweden. I needed a reboot, and Sweden in the summer is a grounding, calm, relaxing place for me. We spent most of our days drinking coffee and sitting on her small balcony, two chairs squeezed in between the huge basil plants who had decided it was their summer mission to grow as big as they could. “I think I have too much basil,” said Orianna. “I don’t think you’re allowed to say things like that,” I replied, thinking of all the times I had barely managed to keep a basil plant alive, only to be able to pluck a few leaves here and there and use for garnish. I had never achieved the freezer full of pesto that Orianna had in the kitchen, and I still hadn’t. It was all about fika for those few days. It felt like all we did was sit in the sunshine and drank our coffee, a plate of chokladbollar sitting between us. As they’re simple, chokladbollar are a common fika treat to make at home. You take room temperature butter, mix it with cocoa powder and sugar, and then add oats. You mix it with your hands, the grease of the butter getting between your fingers. It’s almost a meditative process. Orianna and I had made a big batch. For fear of eating one – or three too many – the rest had gone in the freezer. This memory of making chokladbollar and eating them for fika on Orianna’s balcony has always stuck clear in my mind. I’m not sure why. We have made many meals together, drank many cups of coffee together. But for some reason, those few days when it was just us, two friends soaking up the summer and each other’s company, the simple moment is etched in my memory. And I think of it every time I make chokladbollar. I have made a lot of chokladbollar in my life, and over the last year I’ve moved away from the traditional version to something a little more, well, healthy. 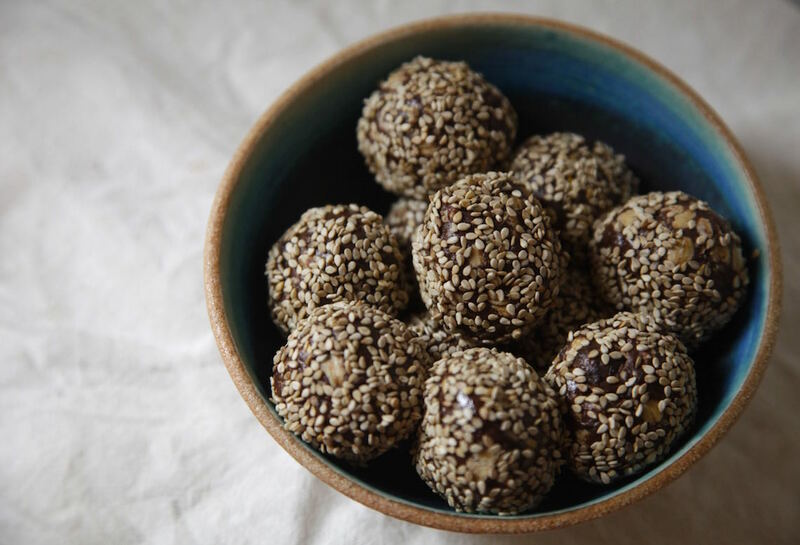 A combination of almond and peanut butter and sweetened with honey, this version is almost more like an energy ball that you could take with you on a long bike ride. And if there’s anything better than balcony fika it’s bike ride fika. 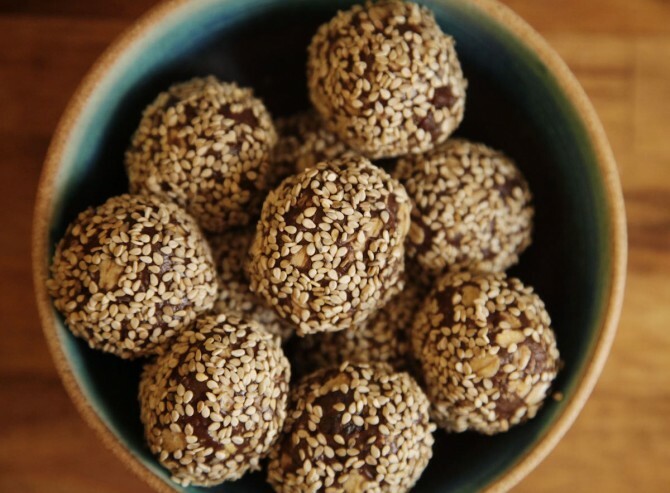 But don’t worry, these chocolate balls work well for just normal fika too, whether you’re sitting on a sunny balcony, or cooped up inside on a gray and rainy day wishing for summer. Hopefully you have someone to share them with. Because fika is meant for two. Pulse the oats in a food processor a few times, so that you get a coarse meal. This makes for a nicer texture in the end product, so if you don’t have a food processor, just buy the smallest sized oats you can find. In a bowl combine the nut butters and honey and mix until well blended. Add in the cocoa powder and mix until it is all mixed in. Add in the oats, chopped apricots, orange zest and salt and work together with your hands. Use your hands to roll the mixture into small balls – you can make them as big or small as you want to. Roll the balls in sesame seeds. Oh, and that papercut above? I made that. Because all work and no fika makes one a dull horse. Love fika? There’s a whole book on that. 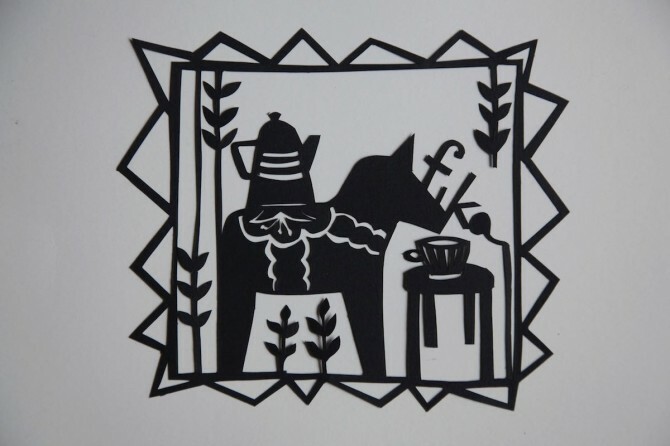 Check out Fika: The Art of the Swedish Coffee Break. And follow the Friday Fika series. These look nom nom good! I assume one would mix the oats in when combining butters? They sound like the perfect energizing snack! !